Do you tip a robot? In the future, self-driving vehicles might not be the only autonomous machines we see driving around, as more companies start experimenting with wheeled robots as a means of delivering goods. This Thursday, on-demand delivery firm DoorDash will start using its fleet of small, mobile machines to fulfill orders. First reported by BuzzFeed, the fleet of six robots are being put into action on the streets of Redwood City, California later this week following 20,000 miles of testing. They’ll transport food from restaurants to the doorsteps of customers who live anywhere from one to two miles away. London- and Estonia-based robotics firm Starship Technologies built the robots, which use cameras, GPS, and computer vision to navigate routes and detect obstacles. They're able to carry 22Ibs of food in their locked compartments, which customers can open using a link sent to them once their order arrives. Despite passing 4 million people, nobody has tried to vandalize or steal from the robots. And even if a person did try to walk off with one, their location is tracked at all times. Henry Harris-Burland, Head of Global Marketing and Communication for Starship, said future versions would include an alarm that sounds if somebody tries to pick up one of the machines. DoorDash isn’t the first company to try out food-delivering robots. Domino’s Pizza unveiled the world’s first “autonomous pizza delivery vehicle” in Australia last year. As is always the case with automation, there have been questions over whether this is another example, albeit in the early stages, of a machine taking a human’s job. But according to DoorDash co-founder and chief product officer Stanley Tang, the robots are "a complement, not a replacement." 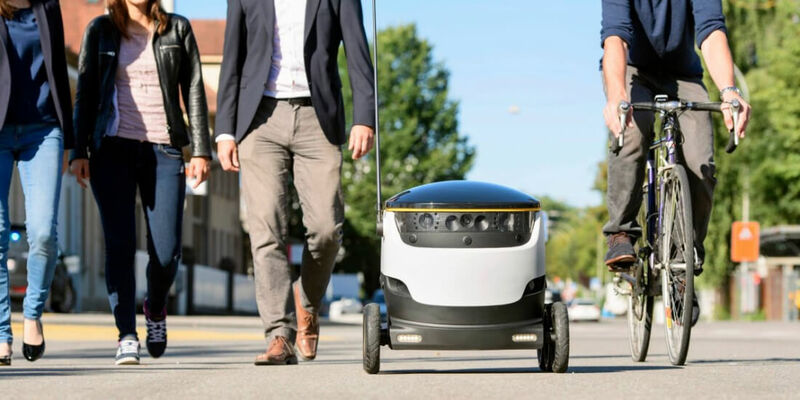 “We’ve found that the robots are better suited to the smaller, short-distance orders that Dashers often avoid, thereby freeing up Dashers to fulfill the bigger and more complex deliveries that often result in more money for them,” he told BuzzFeed. DoorDash plans to expand the robot delivery program to other parts of the US, and has recently started testing them in Washington, DC.